Remember him? I know you do. So today Jenni and I went to "the Broadway," as she calls it in her never ending love affair with the definite article. We actually got in this time because we paid The Man a lot of money. The Drowsy Chaperone is a new musical comedy. There's a tap dancing groom, pun weilding gansters, an over-the-top Latin lover, and a dance featuring blindfolds and rollerskates. 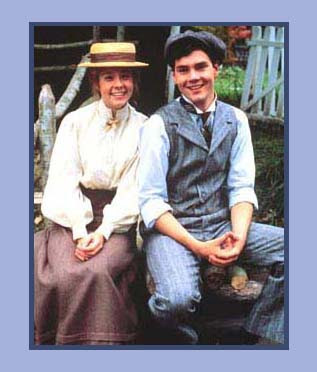 It also stars Gilbert Blythe. I'd like to say, "What a treat!" But I'm afraid that it will sound corny. 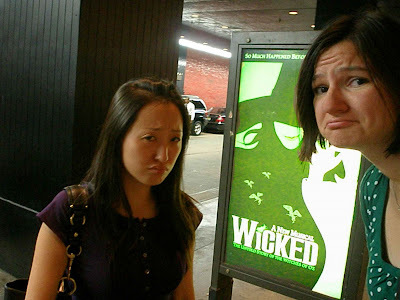 So, we had hoped to replicate last year's success with the Broadway lottery. Well kids, here we go. After months of planning, weeks of leaving, and days of packing, I've completed the first leg of the BM. I'm now in New York with my friend Jenni Kim for a whirlwind weekend of crizz-aziness before finally heading over to England for grad school. I'm taking my dad with me - because I'm secure in my grown-upness. We're going to bash around England for a week (and hopefully procure some accomodations for Jessi) before he heads back to his real life. My brother once drove from Anchorage to LA with my father in what he dubbed "a ten day nugget of wisdom." I have high hopes. We've already covered Morality in America, Creativity and the Christian, the definition of "impossible," and John Piper. Well, I'm pretty sure that Piper has not yet been exhausted. We flew from Anchorage to Newark together, but then parted ways at the airport. I went to Jenni's to spend the weekend eating and going to shows and shopping, and he's going on some man-vacation that will involve many many hours behind a car wheel, a fair amount of sunflower seeds, and more cans of A&W Diet Rootbeer then I care to dwell on. We will meet up on Sunday afternoon for our trip across the pond. Oh my goodness, the Alaska State Fair, aka Mecca of Fried Food. We poured honey on our fried bread - you know, to sweeten it up a little. Appropriate order of operations: Ride then eat. Anchorage isn't really known as the comic venue of America. In fact, it is a notable event when big names wander into our neck of the woods. So when B.J. Novak (big name, small man) came up for the UAA kick-off, we rearranged our busy schedules to attend. It was a lot of fun, and we were only three rows back. He sounded just like Ryan from the Office. It was eerie. This is him reading his new children's story "Wikipedia Brown"
Sorry about the poor picture quality. I didn't want to use the flash at the risk of being singled out for public mockery. 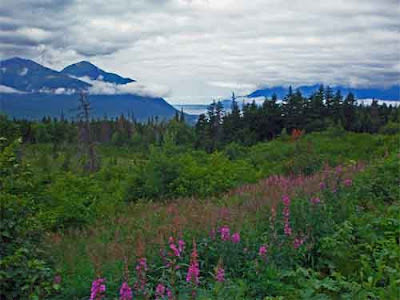 Here are some pictures from my cruise to Alaska. It was a great trip with Linda, Katy, Mom, Aunt Lucy, and Mrs. Harding. Katy and I enjoyed this sign warning drivers in Petersburg of speed bumps. You can never be to careful, that's what I say. With our eyes fixed on the future grace that has been promised, believers in Christ reside, or "camp" if you will, in hope throughout our born again lives. Recently, I was able to not only camp in the state of hope, but also in the town. Actually just outside of Hope, but I can't come up with any theological tie-ins with Coeur d'Alene Campground. We car-camped in Coeur d'Alene on a beautifully overcast night. Jannell's set-up in the back of her wicked-awsome truck. Stephen's set-up. I especially like the rifle. My set-up. I think it was more comfortable than my bed at home.